Maggie presents what she gained from talking with the engineers. Maggie’s project is to have students develop structures that demonstrate multiple slopes using manila folders with graph paper on them. Engineers provided ideas about unit conversions, volume calculations, surface area calculations. Folks talked about helping Hoopa Elementary students to learn about local projects from engineers. In addition, there is a Caltrans engineer in Hoopa Valley who could talk with students. Becca discusses the different language engineers used to analyze her project. Becca enjoyed listening to how the engineers thought about her project. Each engineer analyzed the project a little differently. Errin found many good engineering contacts. Engineers thought he would need permits and surveying. Errin discussed that the city is interested in the project now and so is the school… someone has to get it started. He made contacts with Caltrans engineers and Winzler and Kelly engineers. Brooks presents ideas for EHS engineering club. Brooks thought a good question was “were you in a club in high school?” Brooks got good ideas about field trips to engineering projects. At EHS there are career paths for service learning. One possible service learning project is to teach middle school children about STEM. They could also participate in the Rube Goldberg competition. Maggie mentioned the physics day at 6 Flags in the Bay Area. She also knew about a place to get inexpensive science kits. Dan presents chair design concepts. Dan mentioned the engineers suggested he use iterative design. They suggested that they design a prototype/practice chair. Participants suggested a smaller prototype, maybe with hot glue. After making the practice chair, the students could then carefully design their cardboard chair. Dan is thinking to use duct tape rather than wheat paste. 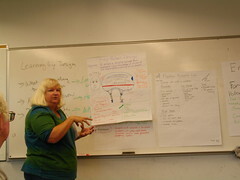 Sheryl presents engineers' ideas about her bike helmet design project. Engineers helped Sheryl think about using melons vs. eggs to do testing. They helped her think about how folks will fall off their bikes and about collision types. They suggested using films of testing and then studying them in slow motion. There were lots of ideas asking students what makes a good helmet. Students could consider redesigning and redecorating. Students could consider the life cycle of a helmet. Sheryl uses this project to help students learn how to cooperate and to learn more about physics. Student teams often choose to tape the squirreliest child to the wall. First the student stands on a chair. Then, the teams wait to see which student stays on the wall the longest. 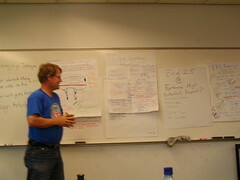 Ken presents regional Rube Goldberg contest ideas. Rube Goldberg devices take a simple task and make it complicated. Ken talked about how some of the visiting engineers thought that is what engineers do!…. While others said engineers do exactly the opposite. The Engineers suggested using an open ended environmental theme. Some logistical issues that Ken is thinking about include 1) having a presentation of the devices at the Math Festival at the mall 2) how to encourage teachers to participate, as some teachers prefer “tidy” projects. Ken thinks each team should have a door and saw horses provided. He is also developing a list of partners and sponsors including the Discovery Museum and possibly local engineering firms. DYF could be a sponsor/partner. Ellen was pleased to learn how many of the engineers she knew already. Some ideas suggested by the engineers included having individual students develop a design idea as homework and then come to class ready to work in groups. She also has the idea of adding an opportunity to re-design (iterative design). She is thinking of having 3 to 4 person teams. We discussed the option of providing the students some opportunities to develop teamwork skills. One exercise is to take turns continuing an idea with “Yes, and….” and then try continuing an idea with “Yes, but…. ” Using “Yes, and” provides a much more positive environment for working and brainstorming. Other teamwork communication exercises are available in “Teaching Engineering Made Easy”. Forrest presents favorite rocket design idea. Forrest shared his favorite bottle rocket design. Maggie found a similar site. 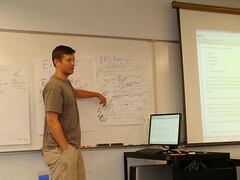 Byron focused on developing electronic curriculum that was standards based. 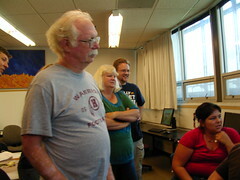 He commented that both Julie and Lonny encouraged him to think about what the students would be able to design. After a quick software orientation by Lonny, including an overview of criteria for an excellent bridge, participants each designed their own bridges using the free West Point bridge design software. Some participants explored creating a bridge that was a contender for the Living on the Edge” award, which explores the trade offs of cost and safety. Some people explored different bridge designs including suspension. Errin explains to Maggie how he used the software to design a bridge. Forrest, Sheryl and Byron examin Errin's bridge. 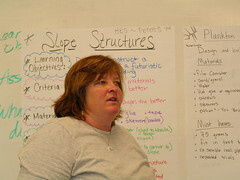 The participants then discussed how they might include the bridge curriculum in their classes. Lonny let folks know that the standards that are met by the curriculum are in the notes of the PowerPoint from yesterday. Teaches discussed the playing the “numbers game” with STAR testing by determining who to give the test to. Some folks are holding students accountable by how they do on the test. If they do not do well, they will be put in remedial classes. So, some students are are trying harder. At one school, 7th graders could earn back credits by doing better on the STAR scores because there was no summer school this summer. The Building Big straw and gumdrop hands-on exercises will be useful for 7th grade. The pasta exercise will need to be modified as discussed yesterday to be useful. Participants had a discussion of how important to use triangles instead squares when designing bridges. 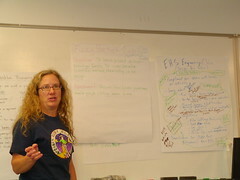 Sheryl uses a amusement park simulation program as part of her end of the year curriculum. She gives each team the same amount of K-NEX and they design a amusement park. They can barter for parts from other teams. One take home message is to be more explicit about the design criteria when working with students. It is important for students to learn how to work with weighted scores. We discussed the idea of working with the students and/or the client to develop criteria. We discussed the difficulty students and parents have understanding weighted averages. Ideas of using tubes of paper to build as presented in Building Big. We discussed that a common misconception is that the Tacoma Narrows Bridge failure is due to resonance. However, careful analysis points to aeroelastic flutter. 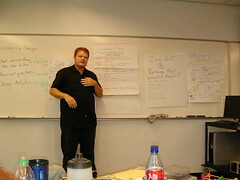 After lunch, Lonny shared that two of his favorite TED presentations are by Amy Smith and Jill Bolte. Beth really enjoys Susan Savage-Rumbaugh’s and Sheila Patek’s presentations. We watched Ken Robinson’s presentation on how schools kill creativity on TED. We then had a discussion of the difficulty of working within the constraints of our existing educational system. We discussed how many are saying Engineering Education needs to change, including the National Academy of Engineers. We discussed the idea of a Learning Organization and how institutions need to be more willing to take risks and make mistakes, just as our students need to learn to be willing to make mistakes, as mistakes are part of being creative. We discussed the importance of risk taking and making mistakes as part of being creative. We also talked about the importance of being tenacious and being will to try again, even if it does not go so well. 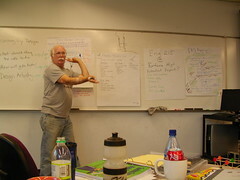 Folks completed the post assessments for engineering attitudes, teaching engineering and for static/bridge physics. 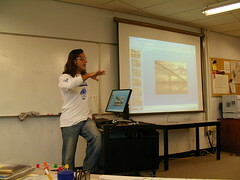 Lonny presented on appropriate technology projects that students have worked on. He also talked about Point Positive: the idea that it is time to start demonstrating what people can do, instead of castigating against what they should’t do. All of the project examples came from Appropedia – Projects. Participants expressed interest in many of the technology engagements. Participants discussed the difficulty of maintaining a garden during the high-yielding summer months when the students are not in classes. A few participants expressed interest in doing a bicycle powered energy project. Beth and Lonny thanked the participants. 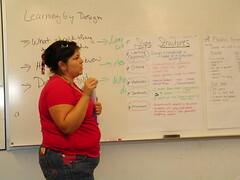 Brandie and Rebecca met with the participants to complete a focus group to assess the institute. Participants picked up their materials for the Save the Penguins curriculum.